الخيار الأفضل للحصول على المتعة والاسترخاء, سي شيلز ماندورا يقع في منطقة ماندوراه سيتي في ماندوراه. يجذب هذا الفندق ذو 4.5 نجوم، والذي يبعد 2km فقط عن وسط المدينة و 80km عن المطار، الكثير من الزوار سنوياً. يوفر الفندق بفضل موقعة الجيد وصولاً سهلاً إلى أهم معالم المدينة.
. إن الخدمات الممتازة وحسن الضيافة العالي في سي شيلز ماندورا تجعل إقامتك تجربة لا تنسى. يمكن لضيوف الفندق الاستمتاع بالميزات التالية على أرض الفندق: مرافق مخصصة لذوي الاحتياجات الخاصة, تخزين الأمتعة, واي فاي في المناطق العامة, صف السيارات, التوصيل من وإلى المطار . تنعكس أجواء سي شيلز ماندورا في غرف الضيوف.تلفزيون بشاشة مسطحة, اتصال لاسلكي بالإنترنت, مسبح خاص, حوض الاسترخاء, غرف لغير المدخنين هي بعض الميزات الموجود في العديد من الغرف. صممت خدمات الاستجمام في الفندق والتي تتضمن حوض استحمام ساخن, مسار جولف - ضمن 3 كم, حمام سباحة خارجي, سبا, ملعب تنس لمساعدتك على الاسترخاء والراحة. اكتشف مزيجاً ساحراً من الخدمة الاحترافية والخيارات الواسعة من وسائل الراحة والمتعة في سي شيلز ماندورا. Fantastic ocean view, free on demand movies, wifi (although capped at 5gb but reasonable). Nice pool and good access to beach. Free parking. Slightly indifferent staff but they get the job done. Will consider staying again if back in Mandurah. We stayed in an Ocean View Villa (ground floor) and the view was absolutely stunning!!! Direct beach access and uninterrupted views!! Waking to the sound of the waves was marvelous! I would highly recommend Seashells Mandurah!! The only negative is the supplies the self contained room comes with. The rooms are serviced weekly (unless you pay a fee) which is fine however, the apartment definitely needs to come with more cleaning supplies. We were only given 2x bin bags, 2x dishwasher powders and 1 and a half rolls of toilet paper. The amount supplied should reflect the length of stay. For $300pn I dont think that's too much to ask....? Will definitely be back!!! We had an amazing time. We arrived early and although the room was not yet ready the staff kindly organised our cold food to be taken to our villa. The villa was clean, and we had full beachfront views from our balcony. The rooms were spacious and we thoroughly enjoyed our time at Seashells - a fabulous birthday experience with the Christmas lights cruise added in. The main room is abit stuffy with the fan going very slow. The other room bed size is a single size mattress. Small for my 2 child aged 9 and 11. Expecting the bed to be at least a super single size. Having said that the unit is clean and bed is comfortable and clean. Nice pillows and clean sheets. The pros , big area , nice sea view. Tv has a spread of new free movies for viewing. Kitchen area was big and great for cooking . Nice rms. Has a washer and a dryer . Showering area has mixers for a hot shower . Cons ,However the dryer took me a long time to get my clothes dried . The bathtub wasn’t that good can be improved and the restrms doesn’t comes with bidet sprays . 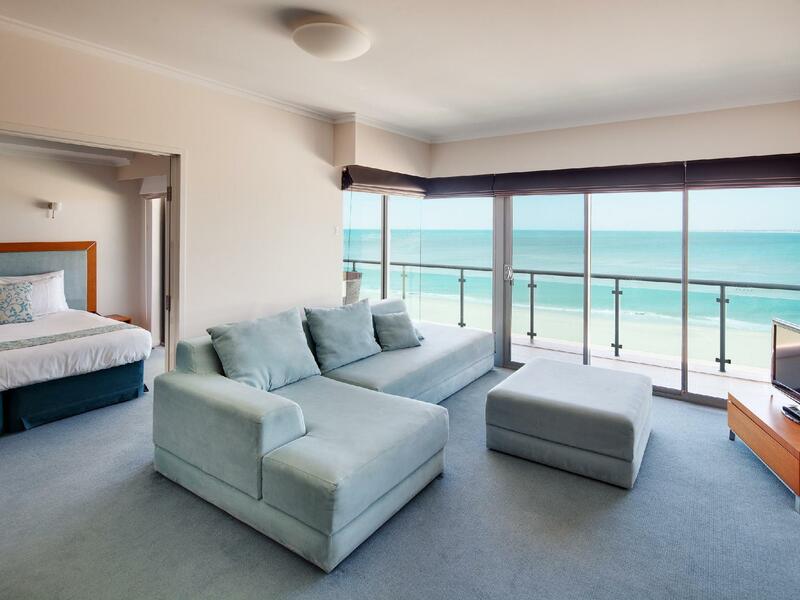 No house keeping until check out ..
Easy access to the beach and great sea view from the apartment! Clean fully equipped kitchen allows us to cook without any issue. Parking is free which is a great deal too :) The only downside is with the exception of the main door, all the other doors in the apartment cannot be locked including the toilets..
We booked 3 bedroom apartment and it was the highlight of our trip to WA. 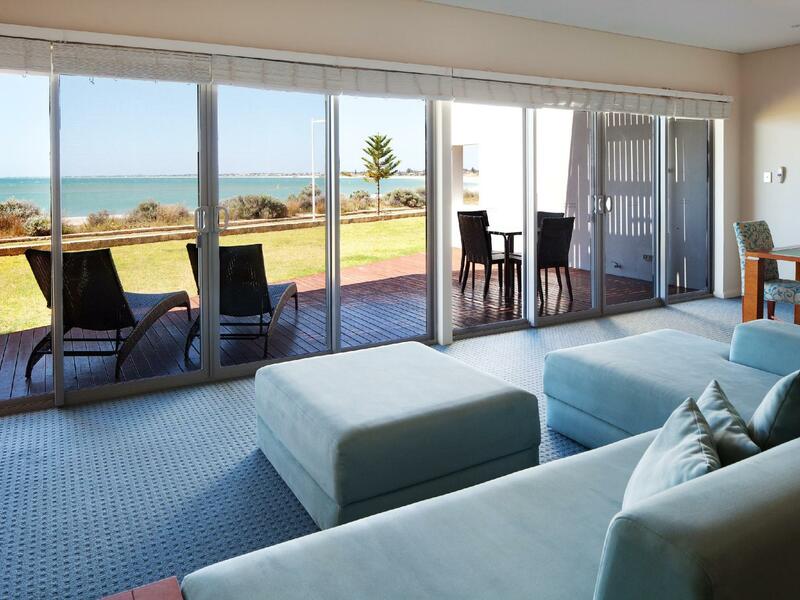 Great sea view from the balcony and master bedroom, very spacious living room and kitchen. The kitchen was well equipped with all the cooking utensils and cleaning aids. Bathrooms were spacious and the laundry facilities were lifesaver! It's a shame that we only stay one night here. 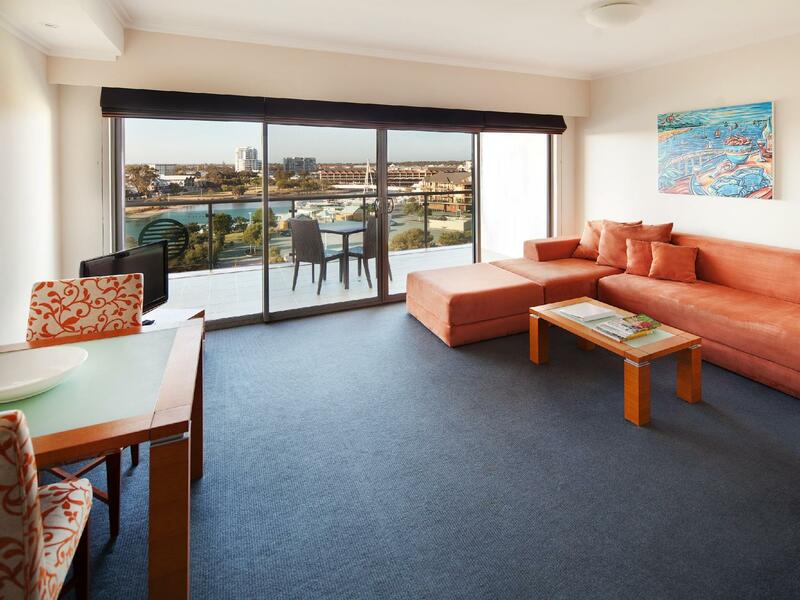 Would definitely book this apartment again the next time if we drop by Mandurah! Fantastic stay here. Located in very easy walking distance of several very good restaurants. Pool are was excellent, very like resort style. Room size was huge, well appointed, good quality fixtures and fittings with a huge balcony. It is one of the best hotels I have ever stayed at. The room is spacious and well equipped. It has washing machine and dyers and dishwasher. This hotel has its own private beach and the view is superb! The swimming pool is beautiful and my kids love it so much. To quote what my son has said "thumbs up for this hotel"! Beautiful hotel, helpful friendly staff (credit to the ladies on the front desk), clean comfortable rooms in a great location. 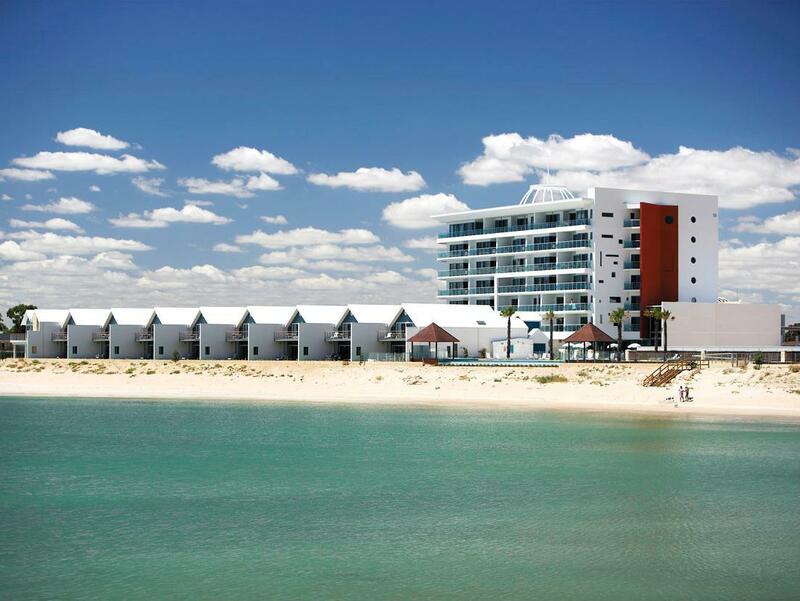 Hands down best hotel in Mandurah!! 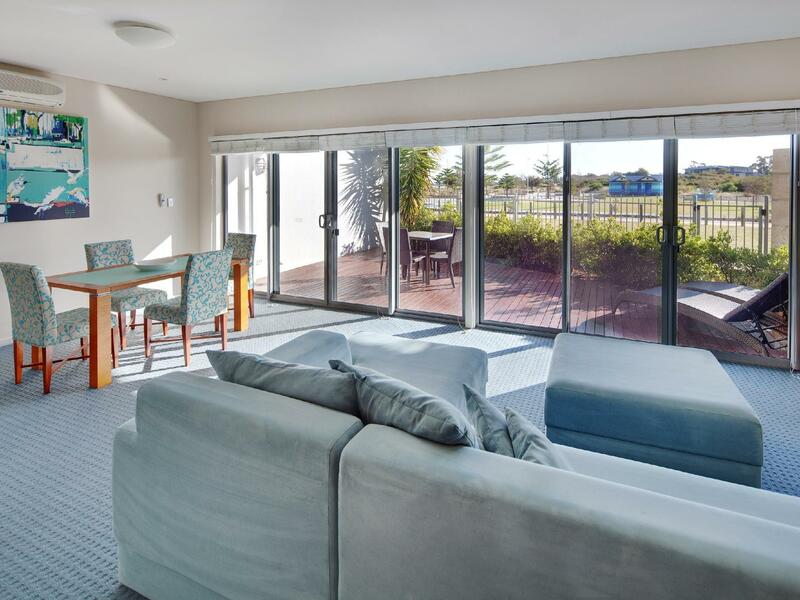 Traveled as a family of 3 adults and 1 toddler, we booked the 2 bedroom ocean view apartment. It was wonderful being able to see the stunning view of the ocean upon waking up. Apartment was v spacious and clean. We didn’t realize that the reception was only opened until 6 pm but there was a after hours number to call so all was good. Will definitely return! Good clean accommodation, very close to beaches, close to a range of cafes, etc on the marina and close enough to the city centre. Kitchen facilities make self catering easy. Friendly staff who were able to change my booking a couple of times due to family emergencies - that was very much appreciated. Very quiet and peaceful place to relax. nice beach, swimming pool. Supermarket is just few minutes away. Food nearby too. Stayed at ocean view 2bed aprt. Stunning view. Fabric sofa is little dirty but everything else is clean and well maintained. Close walk to dolphin quay and shops. Beautiful art work in room. We were able to catch some blue crabs from nearby jetty. Would love to stay seaview villa next time. Booked Seashells Mandurah due to all the positive reviews I read. But I would not stay here again. #1: Asked the staff at reception what there is to do around the area, the staff just pointed to me at the direction of the brochures and said I can just grab the brochures. #2: Was horrid to know that the beach linked to Seashells Mandurah has BLACK COLOR WATER WASTE pouring right into the BEACH!!! I've never found out what waste was that, and I never will want to find out either! #3: We shifted to the waddle pool within the Hotel ground in the end. Mid-way, one of the staff started cleaning the floor tiles around the swimming pool vicinity. Dirty water from the ground were seen splashing into the pool. I had to hurriedly bring my young infant out of the pool due to this inconvenience. 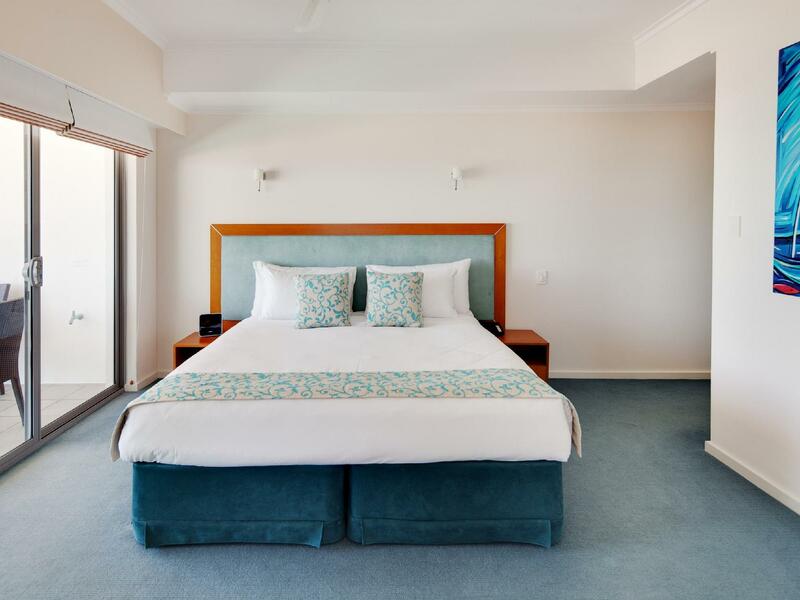 I would definitely not stay here in future, and considering the price I had paid, I would not recommend Seashells Mandurah if you have a problem with cleanliness issues. The 2bm apartment was very spacious and clean. Really nice floor plan with a nice big balcony. Awesome pool and outlook over the ocean. Pool and room furniture of good quality and super comfortable. Loved our stay and though it may be quite expensive, the quality of the premises makes it worth the expenditure. location is near beach but the unit we paid for does not have sea view. but this did not stop me from having a dip in the ocean and what a wonderful afternoon swim that was. the premises has lots of amenities and both young kids and adults alike and is well loved by my family..